Approx 3" drop x 1", on an adjustable leather cord. This carved netsuke of Daikoku, the god of wealth, has the two holes in the back where he would have been hung as a counterweight for a tobacco or medicinal herb pouch. The colorful etching on his robe just adds to the beauty of the piece. 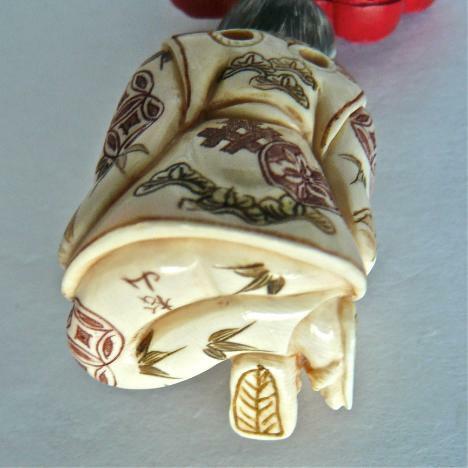 The carved cinnabar piece on the top picks up the colors in his robe. He is signed on the bottom of his foot by the artist that carved him. Daikoku, the god of wealth and bountiful harvest, is also the guardian of the kitchen. He is usually associated with bales of rice, symbolic of luck, or his friend rat, symbolic of wealth and happiness. 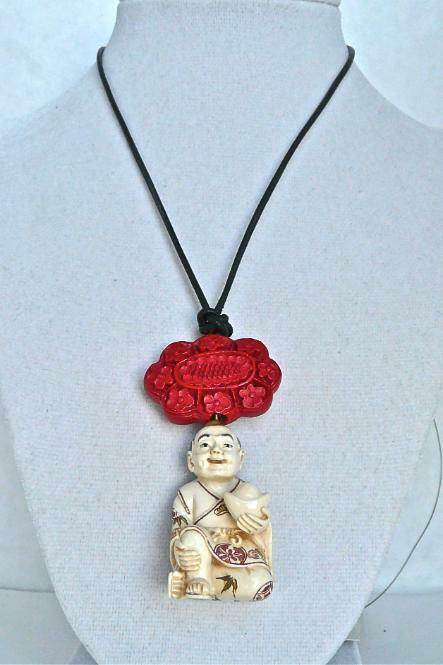 He is the patron of artisans and farmers. He is also the guardian of the kitchen. The netsuke is a miniature carving, usually less than 2" high, created by Japanese and Chinese artists for over 300 years. They portray every aspect of their life and culture. These carvings were traditionally used to prevent the cord attached to a gentleman's medicine box tobacco pouch from slipping though the sash of his robe or kimono. Today they are highly collectible works of art. Traditionally, netsukes have been carved from mammoth and elephant ivory, ebony, fossil walrus tusk, mahogany, rosewood and hippopotamus tooth. The netsukes, often signed by the artist, are getting harder to find s the detail in each piece takes patience and time and the younger Chinese are not so interested in pursuing this art form. Mammoth Ivory comes from the extinct mammoth elephant that roamed the Earth during the Pliocene era from around 4.8 million to 4,500 years ago. Because they are extinct they are not endangered and therefore, are legal and save the African elephant. The artisans that carved elephant ivory are now carving mammoth ivory that is recovered in Siberia.